The design for this brooch was one of a series of brooches and pendants inspired by the gondolas, canals and bridges in Venice. 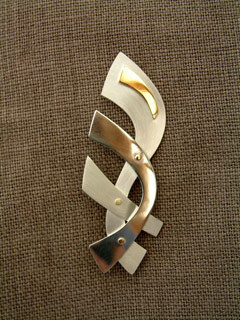 This brooch is made of satin and polished silver sheet with an applied polished gold motif. The parts are held together by gold rivets. The brooch is fitted with a roller clasp pin.